I have just come back from a glorious two-week break in Bali with my family feeling energised and refreshed. In my profession, assessing customer experience across everything I touch and feel is just part of my DNA. So after spending two weeks experiencing flights, airports, resorts, restaurants, elephant riding, white-water rafting and the obligatory forest monkey on your head at the temple, I reflected on what got my gold star for Customer Experience during the holiday? Hands down it was the Waterbom theme park in Kuta, yes a water park! A number of people from our school had been to and recommended Waterbom Bali as a great day trip. As I always do after getting any personal recommendation, I validated with online research from a number of sites like TripAdvisor (where Waterbom got voted the # 2 Water Theme Park in the World and #1 in Asia), purchased the Waterbom tickets online (which were about about 40% cheaper than a single day pass in Australian theme parks) and confidently gathered up our young kids for the big day. When we got out of our taxi about 15 minutes before the park opened, an extremely cheerful staff member greeted us and told us which line to join based on the tickets we had purchased, he was also able to answer our questions about locker facilities within the park. An extremely efficient entry process had us through the gates in under 10 minutes and our credit card used to transfer some funds onto a waterproof Splashband that would be our e-wallet for the day eliminating the need to carry cash. I also liked the fact that purchases using the Splash band needed your first name as validation, a simple 2-factor security step preventing stray bands using your credit without permission. After a quick bag search (that is, unfortunately, the reality of nearly all major tourist destinations in Bali in this age of terrorism) we went straight to the impeccably clean and well-organised locker rooms to pick up some hire towels (for about AUD $1 rental for the day) and then decided to hire a private gazebo (for around $25 for the day) to be our base. At the gazebo, we had a small safe to keep all our valuables secure and were able to order food to be delivered at any time throughout the day from an extensive menu provided. Then on to the rides. For a start, every single ride was open and ready to go from the minute the park opened to the close and we only saw one sign saying a ride was being closed for maintenance for 30 minutes. The entire Waterbom park was clearly signposted with directions to the main attractions at every junction and each ride entry clearly marked with the wait time, age/height/weight requirements and level of thrill. And as an added bonus to those fitness-minded, the signs even told you the number of calories you will burn climbing the stairs for the ride. I noticed some kids keeping a running total of calories burned for the day. On most rides, there was a staff member next to the ride sign dedicated to answering any questions before you started the stair climb and helping those who needed language translation. All the rides had queues no longer than 20 minutes. The Waterbom rides all appeared in impeccable condition and it turns out that they have recently refreshed many of the rides with high-quality waterslides used by many of the major waterparks in the world. The use and integration of tropical plants across the entire 3.8 hectares was incredible with nearly every concrete structure dripping with beautiful creepers and tropical scented flowers like frangipani and orchids. I actually enjoyed standing in the queues just to admire the greenery which was nearly without expectation in the shade of the tropical plants! The staff at the pointy end of all the rides were incredibly trained and diligent in keeping things running smoothly, loading up the people safely and also offering a dose of encouragement and courage where required to those thinking of opting out. If you have kids you will know that once they have conquered the scariest ride they want to go straight back up and do it again. I noticed that staff actually picked up on this, saying great to see you come straight back or the person at the bottom of the ride  giving them a hearty high-five to cheer them on. At the end of most rides was a staff photographer who asked whether you wanted the photos taken tagged to your Splashband for later viewing but with no obligation to buy. The food options were extensive and well-priced, everything from local specialities, through to a hot pizza straight out of the wood-fired oven at the Italian restaurant and your usual fast-food fare, ensuring the taste buds of both parents and kids were well catered for. There were numerous restaurants, bars and cafes scattered throughout the park and the coffee from the French-inspired café was delicious. As we started to see signs of weariness in our young kids, we used the hot showers and still impeccably clean change rooms (they are cleaned constantly throughout the day) to freshen up. On the way out, every Waterbom staff member we encountered gave us eye contact and said hope you enjoyed your day or words to this effect. Before leaving we viewed all the photos that had been stored to our four Splash bands and decided to buy the online package that allowed us to download all the photos at any time for the next couple of weeks from the website. All remaining credit on our Splash bands was promptly refunded back to our credit card. I honestly cant remember a time I have seen such a consistently engaged, highly efficient and genuinely warm staff engagement across the entire day. 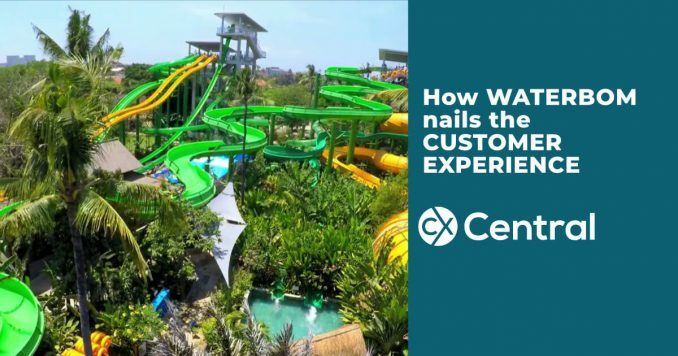 There was no question that Waterbom Theme Park is worthy of its Customer Experience rating. The product is great with quality rides, food & drink options aplenty and a park size and layout that makes it feel familiar and achievable in a day visit. But I have to say the thing that stood out head and shoulders for me is the passion and authenticity of the staff. They transformed a great product offering into a truly wonderful and memorable customer experience. My hat is off to Waterbom, they have done it in spades using the real secret weapon – their staff. You can have the best product in the world but if your staff are not engaged and enthusiastically supporting the product, you will never get great loyalty and advocacy. Even in an increasingly digital world, there is always an opportunity to make any human touch (whether face to face or online interaction) a memorable and great experience. I encourage you to stop and think about what it would take for someone to use your product or service and feel compelled to tell someone? Are your staff adding the customer experience magic that people will remember and remark on? Great customer experience comes from a lot of hard work and commitment behind the scene to deliver a consistent, frictionless and memorable experience. I like to imagine a world where this type of customer experience is what we can expect and enjoy in all our customer interactions, whether in-person or online – wouldnt that be great! From the editor: I also had a great trip at Waterbom so if you are in Bali I encourage you to check it out! The key takeaway from the article, of course, is the ethos of looking after your employees so they can look after your customers! I have been working in this ever-changing industry for 27 years spanning marketing, sales, executive and commercial roles working across a diverse range of companies including several start-ups, multinationals and self-employed as a strategic adviser.I'm passionate about helping clients solve complex business problems and delivering tangible results to their employees, customers and shareholders.